One just needs to plug the broadband cable to a device developed by the team which would transmit the internet using the broad casting frequency. A successful effort to take high speed internet to over six lakh Indian villages by an IIT Bombay team failed to get support from the government. But, the same indigenous television white space technology developed by the team has now won Mozilla Corporation’s ‘equal rating innovation challenge’ at Brussels on Wednesday. The team has got $125,000. The Gram Marg Solution for Rural Broadband project team was working for last three years on exploiting television white spaces— television ultra-high frequency band which was once used for broadcasting cable channels until the broadcast industry embraced digitization and started satellite direct to home services. One just needs to plug the broadband cable to a device developed by the team which would transmit the internet using the broad casting frequency. At the users end, a conversion device will change the broadcasting frequency to 2.4 Gigahertz used for Wi-Fi. 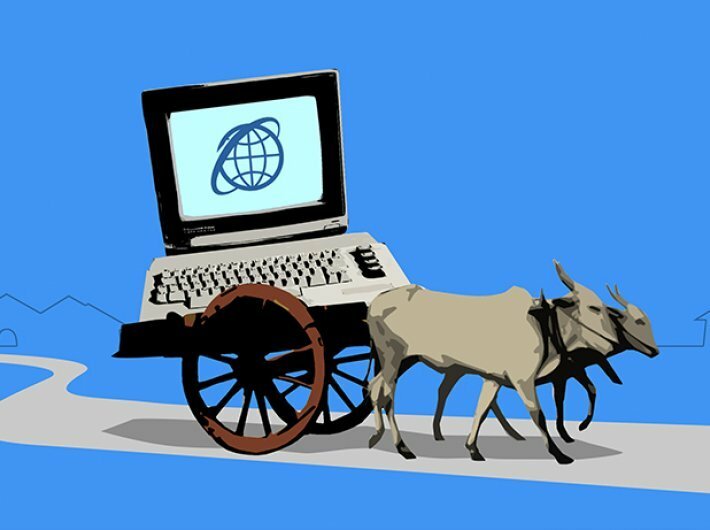 White Space technology solves the last mile connectivity challenge. A major challenge in having a scalable white space technology is the deregulation of TV white space spectrum band. Despite its utility, the department of telecommunication (DoT) refused to delicense the band, and hence made all the work done by Professor Abhay Karandikar’s team pointless. In the meantime, Gram Marg deployed their solution in 25 pilot villages to provide broadband access, which Mozilla calls ‘frugal 5G’. “The TV UHF band rests with a national broadcaster and though it is underutilized and in some cases it is not utilized at all, the band is not available for providing broadband services. So in terms of regulatory and policy challenge, this is the biggest challenge we faced,” said Professor Karandikar, in his submission to Mozilla innovation challenge. The team comprises of master and PHD students at IIT Bombay as well as full time project managers and project scientists. “Gram Marg technology addresses the problem of connecting the unconnected and undeserved population. The technology basically exploits the TV White Spaces or TV UHF (ultra-high frequency) band spectrum to create a middle mile for connecting the Wi-Fi hotspot to a fiber point of presence,” he said. “This top prize of the innovation challenge is awarded to a solution the judges recognize as creating a robustly scalable solution – Gram Marg is both technology enabler and social partner, and delivered beyond our hopes,” said Katharina Borchert, chief innovation officer, Mozilla Corporation, in a blog. Since the beginning of the innovation challenge in October 2016, Mozilla received 98 submissions from 27 countries. The corporation shortlisted five semi-finalists in January. These shortlisted teams presented their projects to a panel of judges on March 9 at the equal rating conference in New York. The challenge was then thrown open for one week round of public voting, which was taken into consideration by the judges in selection of the winner. “Whereas previously many people believed providing affordable access was the domain of big companies and government, we are now experiencing a groundswell of entrepreneurs and ideas celebrating the power of community to bring all-of-the-internet-to-all-people,” Borchert said. “The Gram Marg team has created an ingenious and “indigenous” technology that utilizes unused White Space on the TV spectrum to backhaul data from village Wi-Fi clusters to provide broadband access (frugal 5G),” she said. The team of academics and practitioners have created a low-cost and ruggedized TV UHF device that converts a 2.4 Ghz signal to connect villages in even the most difficult terrains,” she said. South Africa’s AFRI-Fi: Free Public WiFi project has been recognized as the ‘runner-up’ with a funding award of $75,000. The project is an extension of the successful Isizwe project, which entails giving people 500 MB data for free per day. AFRI-Fi project aims to ensure viability of the project through “engaging users meaningfully with advertisers so they can “earn” free Wi-Fi”. The team presented a compelling and sophisticated way to use consumer data, protect privacy, and bolster entrepreneurship in their solution, Borchert said. “The team has proven how their solution for a FREE internet is supporting thriving communities in South Africa. Their approach towards community building, partnerships, developing local community entrepreneurs and inclusivity, with a goal of connecting some of the most marginalized communities, are all key factors in why they deserve this recognition and are leading the FREE Internet movement in Southern Africa”, said Marlon Parker, founder of Reconstructed Living Labs, on behalf of the jury. The “most novel” award worth US$30,000 was given to Brazilian Free Networks P2P Cooperative project. Rather than focusing on technology, the team has created a financial and logistical model that can be tailored to each village’s norms and community. The innovative way the team deconstructed the challenge around empowering communities to build their own infrastructure in an affordable and sustainable way proved to be the deciding factor for the Judges, she said.